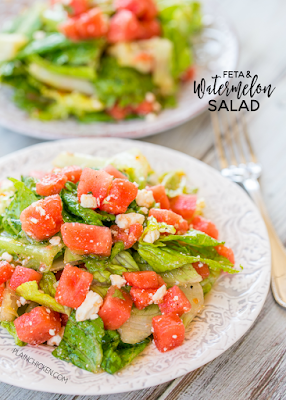 Feta and Watermelon Salad - CRAZY good salad recipe!!! I don't even like watermelon, and I LOVE this salad! You can make the dressing ahead of time and toss everything together when ready to serve. Great for dinner parties, potlucks and cookouts. One of my all-time favorite salad recipes! SO easy!!! This recipe is from my dear friend, Becky. Funny story about how I met Becky. I like to say that she picked me up in a bar. LOL! What really happened is Becky was a Plain Chicken fan and recognized me in a restaurant. She came over and introduced herself and we've been friends ever since! That was over three years ago. The internet is a wonderful thing sometimes. Sometimes you get the crazies, but most of the time you find wonderful people. Back to the recipe! This Feta and Watermelon Salad is from Becky. She made when we ate at her parent's house for the 4th of July last year. 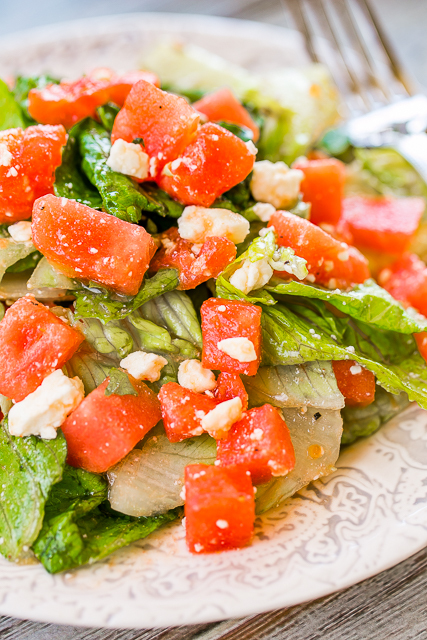 We aren't watermelon fans, but we both devoured this salad. Becky used goat cheese in her salad. Goat cheese is probably the one cheese that I don't like, so I used feta. As we say in our house - "everything is betta with feta". You can make the dressing ahead of time and assemble the salad right before serving. If you are doing that, I suggest putting the dressing in a mason jar so you can shake it up really good before serving. You want to make sure that the oil is mixed into the rest of the ingredients. We are whipping this up on Memorial Day - you should too! 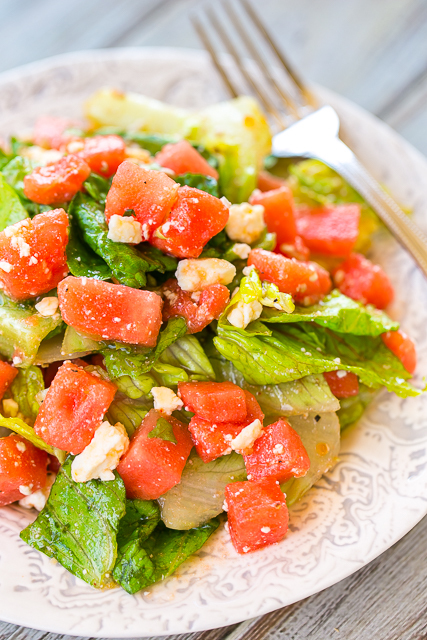 In a large bowl, combine romaine, watermelon and feta. Set aside. Whisk together pepper jelly, vinegar, sugar, lime juice, onion powder, salt and pepper. Slow whisk in olive oil. Pour dressing, to taste, over romaine mixture. Toss to combine. Hi Steph! My daughter and I are both allergic to watermelon (and kiwi), but we love fruity salads like this! Is there another fruit you recommend to pair with the feta and dressing? Thank you! What about strawberries and blueberries? Yum! So I made the salad and used balsamic vinaigrette. It was delish!!! Hi, Steph. Your salad looked amazing, decided to try it, unfortunately didn't have all the ingredients called for in the dressing, so I just used Balsamic Vinaigrette. It was Delish!! !